The Reuther Brothers is, simply, a terrific book. I look forward to reading it to my children, who I am sure will learn from it and enjoy it. The tale of the Reuther brothers-Walter, Roy, and Victor-is more than a story of how one of America's great unions was created. It is also a powerful example of how teamwork, dedication, and concern for others can improve the lives of many people. This book portrays the brothers' lifelong commitment to each other and to workers' rights, while charting the career paths that ultimately led each one to his involvement with the United Automobile Workers (UAW). In a clear, lively narration that explains many important concepts to young readers, this book describes a string of fascinating events, including Walter and Victor's trip to Nazi Germany, their days spent teaching in a Soviet factory, and the strikes they organized in the United States. Against the background of the Depression and the Civil Rights movement, The Reuther Brothers helps readers to understand the ongoing struggles for economic and social justice. 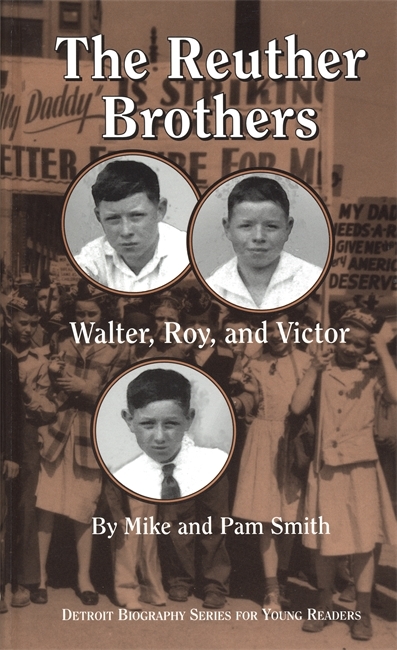 The Reuther Brothers: Walter, Roy, and Victor by Mike Smith and Pam Smith gives young readers a solid look at another important Detroit family as well as a lesson on the UAW's founding and the city's labor movement. Written for the Detroit Biography Series for Young Readers, The Reuther Brothers tells the story of Walter, Victor, and Roy Reuther from their childhood to Walter's becoming president of the United Automobile Workers. Smith does a wonderful job weaving together the Reuther brothers' family story, and their work in building the labor movement. The Reuther Brothers is, simply, a terrific book. I look forward to reading it to my children, who I am sure will learn from it and enjoy it. The Reuther Brothers: Walter, Roy and Victor, by Mike and Pam Smith, is unique because it's aimed at elementary school children. The day will come when our children will decide whether to join a union or honor a boycott or picket line. There are few better stories a child can hear to help them prepare for these types of decisions than the story of the Reuther brothers.